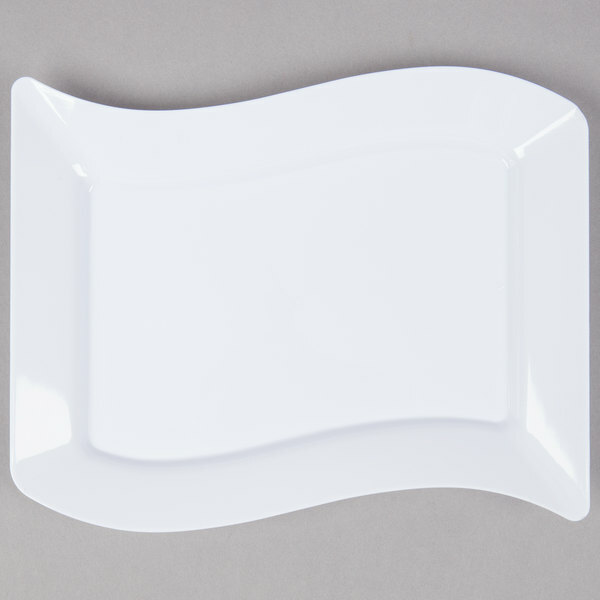 This Fineline Wavetrends 1405-WH 5 1/2" x 7 1/2" dessert plate makes a stylish addition to your party or event! 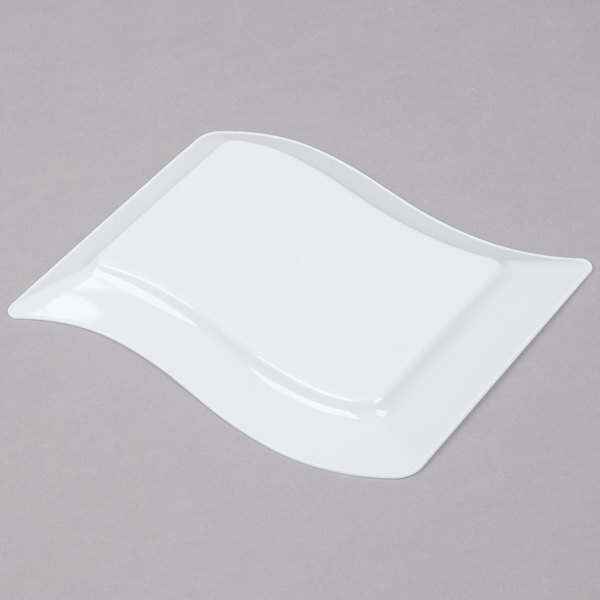 Let your imagination roll with the tide with this Fineline white plastic dessert plate. 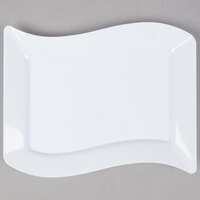 It features ocean-inspired waved edges, making a bold statement about your cuisine. 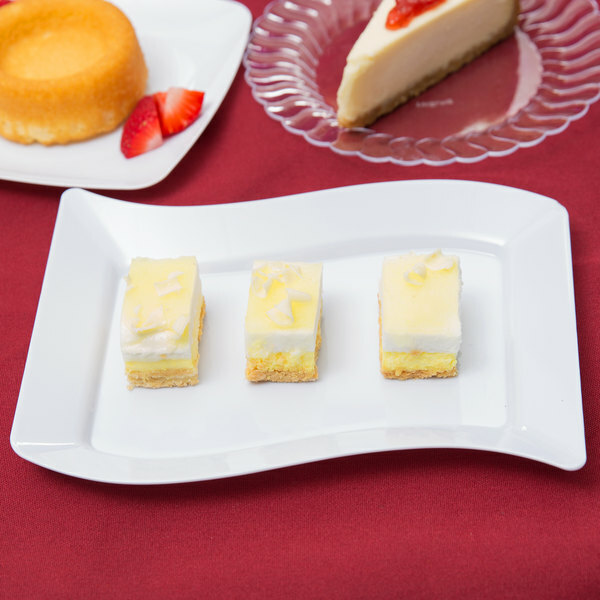 No matter what you serve, the wide rim and flowing lines of the Wavetrends collections will frame your food in a stylish way for a memorable presentation. "Beautiful disposable plates. 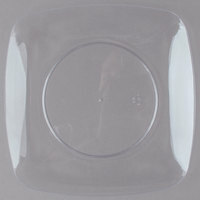 We used these for a lovely bakery made cake at a shower and they showed the cake off to perfection. 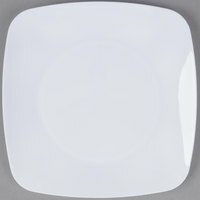 Many people commented on the tableware (all of which was disposable)." 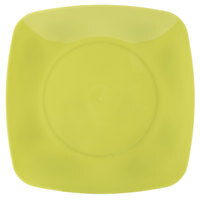 This plate can be used to serve hors d'oeuvres and desserts at parties to add a touch of sophistication to any event. The perfect backdrop for a variety of occasions, it's also great for cookies, cheese and crackers, and shrimp cocktail! 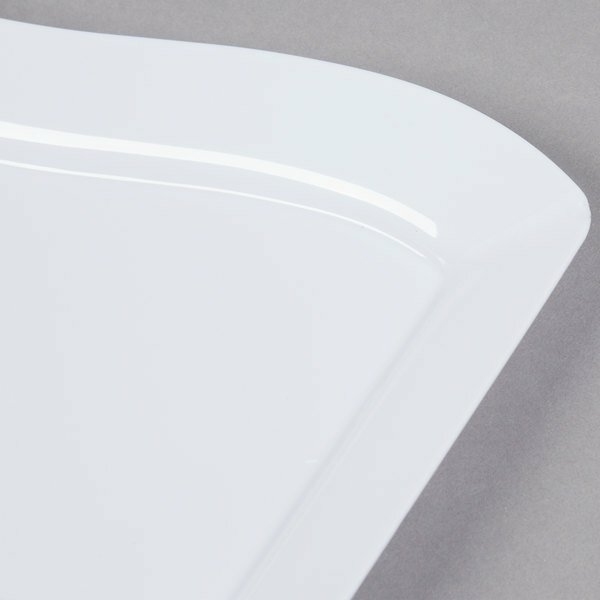 An upscale alternative to standard disposable plates, it offers a trendy and chic look with the convenience of plastic dinnerware. 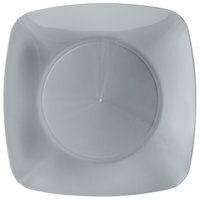 The contemporary design and classic white color adds a unique flair to cakes, pies, and pastries. 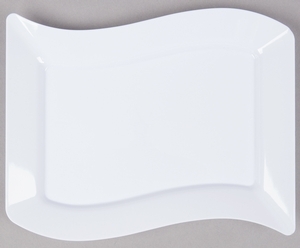 The Fineline Wavetrends 6 1/2” x 10” are perfect for heavy appetizers. 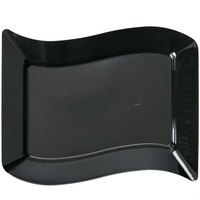 They are very sturdy and you don’t have to worry about the folding into. Love these little plates! I used these to display my handmade lampwork beads for a Trade Show. They were perfect and got lots of compliments!!! 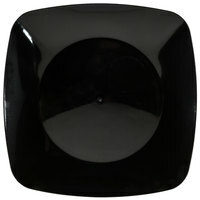 I love these dessert plate, they are very stylish and unique. I always receive compliments on these plates. 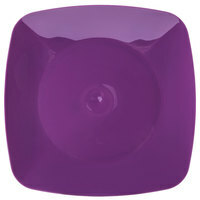 They are perfect for every event, either a fancy BBQ wedding or just a BBQ with the family. 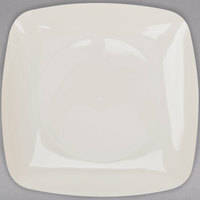 Super stylish dessert plates, I will never go back to old boring round plates. They are small but sturdy - I never had issues with cracking or breaking with heavier appetizers. 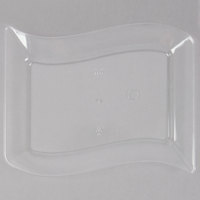 Beautiful disposable plates. We used these for a lovely bakery made cake at a shower and they showed the cake off to perfection. Many people commented on the tableware (all of which was disposable). 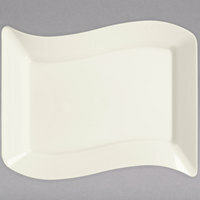 Wish I had taken a picture....these dessert plates were perfect for a casual style rehearsal dinner. I actually was able to wash some in the dishwasher and plan to use for a picnic. I love these cute little plates. I have used them multiple times and washed them in the dishwasher several times. They hold up and still look like new. Amazing! These plates are great. 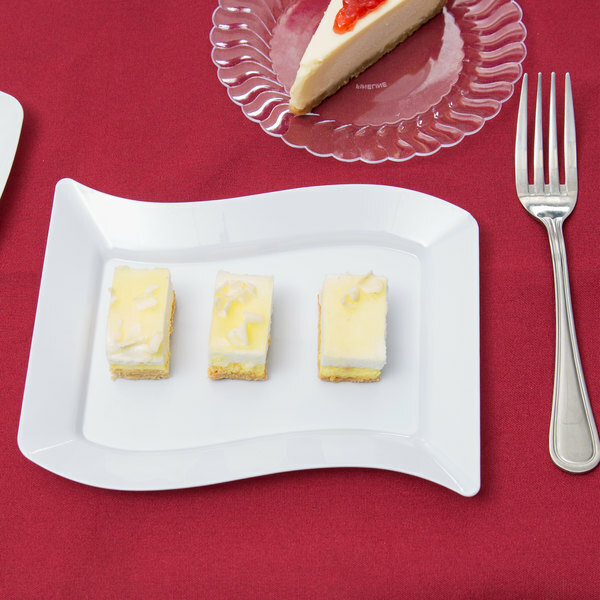 They are listed as a dessert plate. I have used them for much more than that. They are great for appetizers and cocktail parties. I would recommend them for sure.